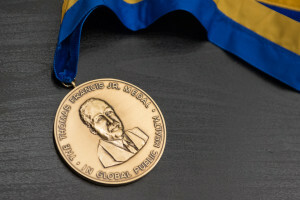 ANN ARBOR—Many simple solutions for human poverty already exist, but the challenge is figuring out how to deliver them, said the newest recipient of the Thomas Francis Jr. Medal for global public health. 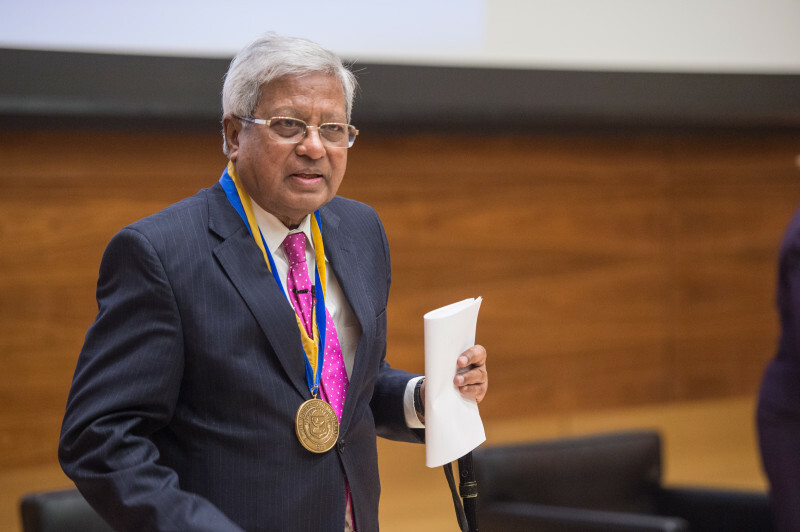 The award, one of the most prestigious honors at the University of Michigan, was given to Sir Fazle Hasan Abed. The Bangladeshi man left a successful career in business more than four decades ago to become the founder and chairperson of the world’s largest non-governmental development organization. “In global development, it is not the lack of new, bright ideas that is impeding progress, rather it is our ability to implement these ideas well, effectively and at scale,” said Abed, whose organization was once known as the Bangladesh Rehabilitation Assistance Committee but is now simply called BRAC. Introducing the medal recipient, Martin Philbert, dean of U-M’s School of Public Health, said Abed exemplifies leadership, vision, compassion, service and action. “Through BRAC’s programs, Sir Fazle has been able to reach an estimated 138 million people, a record of achievement that is simply extraordinary. It is public health at its best,” he said. U-M President Mark Schlissel added that Abed’s organization believes poverty is systematic and there is no single answer that will end it. 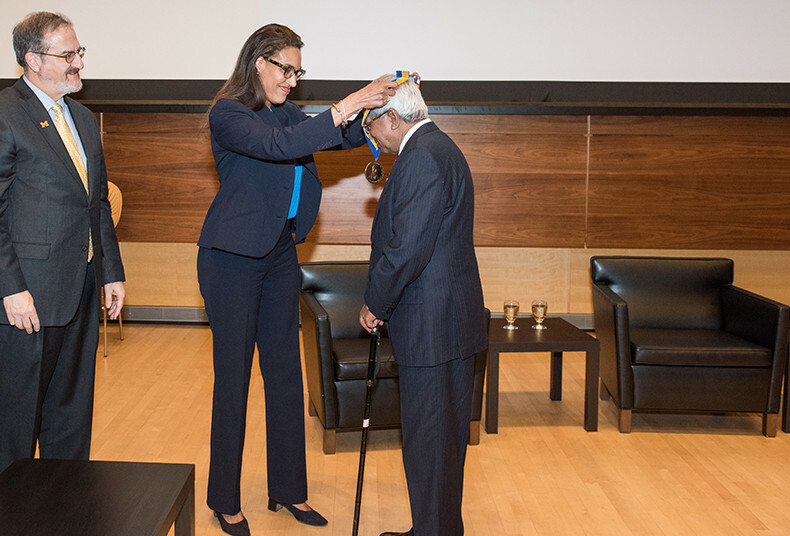 U-M President Mark Schlissel and Regent Shauna Ryder Diggs award the Francis Medal to Sir Fazle Hasan Abed. BRAC’s programs include education, microfinance, skills and job training, health care and empowerment to give people, particularly women and children, the tools and resources they need to overcome poverty. The organization has more than 115,000 employees and works in a total of 12 countries in Asia, Africa and the Caribbean. During his keynote address, “Empowering Communities for Health,” Abed illustrated his point about the importance of delivering simple solutions by describing BRAC’s success fighting diarrhea. “Diarrhea, caused by contaminated water, is the single greatest killer of children in much of the world,” he said. In the 1980s, BRAC was able to reduce the number of childhood deaths caused by diarrhea by 80 percent in Bangladesh by teaching mothers how to mix an oral rehydration solution made of water, sugar and salt. Many warned BRAC that the illiterate women wouldn’t be able to properly mix the solution and would kill more children than they treated, Abed said. But BRAC developed a delivery system that involved female health workers who trained mothers how to make the solution. They simplified the mixing process and made it more routine. They also created a “learning culture” that embraced feedback and failure. And a robust management and monitoring system was created to keep track of progress. “BRAC took the science to the people, to the mothers in Bangladesh, who practiced oral rehydration and saved their children,” he said. Abed was an executive at Shell Oil in 1970 when a major cyclone devastated his home country of Bangladesh, killing upwards of 300,000 people, displacing millions and wiping out tens of thousands of homes, mostly housing for the poor. Within months the country was at war, fighting for independence from Pakistan, which it achieved in 1971. What began as a short-term relief effort, with two-dozen volunteers helping people rebuild their homes after the cyclone and war, turned into a major operation. BRAC has since been called innovative, visionary, resourceful—and some say the biggest attributes—scalable and sustainable. Along with its development programs, BRAC owns 16 social enterprises and uses a business approach to address poverty. Its enterprises in Bangladesh include a lifestyle retailer, a dairy business, hotels and conference centers, and a bank, that together provide economic resources to support the organization’s social programs. This includes about 45,000 one-room schoolhouses, a university and a number of birthing centers for pregnant mothers. Thomas “Tommy” Francis Jr. was the founding chair of the Department of Epidemiology in the U-M School of Public Health, and was the first scientist to isolate human influenza virus in the Americas. He designed and oversaw the running of the field trial of the Salk polio vaccine that involved 1.8 million children from the U.S., Canada and Finland. During a major media event April 12, 1955, Francis announced to the world that the vaccine was “safe, effective, and potent.” At the 50th anniversary of that pronouncement, U-M established a medal in honor of Francis, to be awarded every three-to-five years. The first recipient was Dr. William Foege, known for his work to eradicate smallpox. The second, in 2010, went to Dr. Alfred Sommer, whose research focuses on Vitamin A supplementation as a way to prevent blindness.